Available with FR Backing and Water and Stain Repellant treatment on request. Inspired by a lotus flower this fusion of contemporary and vintage décor presents sheer opulence and beauty. 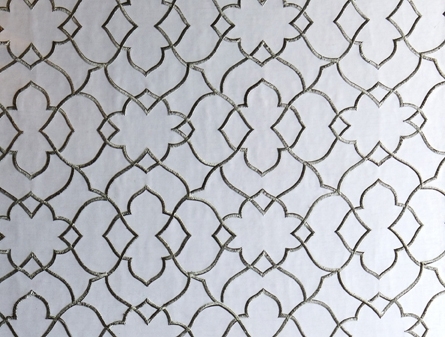 An exquisite overlay pattern of the lotus leaf is mirrored and intertwined to create an all-over continual design. This fabric offers a smooth satin finish base with a heavy stitch embroidery layered with fine metallic gold thread to give a three-dimensional look. This fabric is available as a textile panelling.